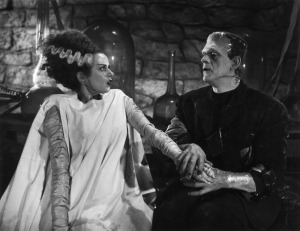 What better place for Frankenstein’s Monster and his bride to tie the knot than Nightfall? The couple, also known as Fred Curtis and Terry Rojas, will exchange vows on Halloween night, Friday, October 31st at 6:30 pm. The ceremony will be officiated by Joe Camarillo of Old Tucson who is coordinating the event for the couple. Following the nuptials, the newlyweds and their guests will enjoy the remainder of the evening celebrating the occasion at Nightfall. Mr. Curtis has been playing Frankenstein’s Monster and making appearances as the popular icon at area malls for the last 20 years. “I love doing it for the children. They get a big kick out of a 7-foot tall green guy,” he says. The future Mrs. Frankenstein is credited with coming up with the idea to wed at Tucson’s oldest and biggest Halloween themed event. Old Tucson is Southern Arizona’s premier film location and Hollywood’s most famous Western movie location recognized in more than 300 feature films and TV Westerns. For more information about Old Tucson, visit www.OldTucson.com or call (520) 883-0100. Old Tucson is located in Tucson Mountain Park at 201 S. Kinney Road, Tucson, AZ 85735. This entry was posted in Haunted Attractions, Home Page, Home Page Slider, News and tagged Fred Curtis, Nightfall, Old Tucson. Bookmark the permalink.